Successfully Added Flexible Multi-Color LED Light Strip - 7 Meters, Premium Quality to your Shopping Cart. 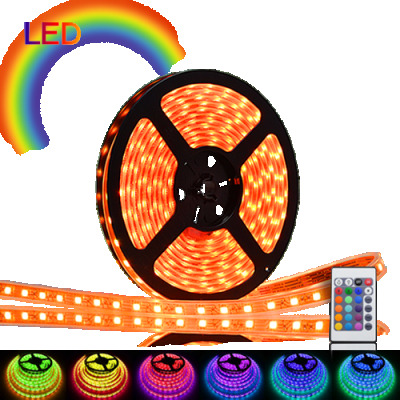 7 Meter Long Premium Flexible Multi-Color LED Light Strip. Easily decorate your house and light up your life. Have you ever wanted to decorate your house, but found that to do it well you ended up using so many different cables and power connections that what you thought would be a simple job is actually quite a nightmare? Well, with this amazing LED strip, you can take up any creative decorative lighting job with total ease! Just wrap the strip around your plants, landscape, or use tape to attach it to any flat surface. That’s it! No special tools or other wiring required to install this convenient lighting product. Made out of soft rubber this LED strip allows you to bend it and twist it into all sorts of different shapes, letters, and words. Great for some fun and the DIY'ers, the possibilities are endless! What‘s more, this LED strip is completely safe for you, your family, and even your ever-curious baby! So you can decorate your stair, room, and outside tree with amazing colors! On top of that, it is covered with a resistant and transparent shell that will prevent it from being damaged by water, UV rays and dust making it safe to use both outside and inside. Ideal for your living room, bedroom, bar, restaurant, shop the light strip brings a cool and refreshing look to your property. In stock now, this 7 meter LED Light strip can be shipped within one working day. Brought to you by your source in wholesale LED lights, Chinavasion. ote that when using this outdoors, while the rope light itself is Weatherproof, the power supply IS NOT. The power adapter, connector, and remote controller MUST BE KEPT DRY AT ALL TIMES!